In just three months, NumberOneEmber will graduate from Osceola County School for the Arts with her writing endorsement. She will be going to a college to specialize in creative writing. She loves to write. She loves to tell stories. Tonight, Amber got to meet an extraordinary, international storyteller. But this storyteller doesn’t write. He doesn’t speak. In fact, he is known for not using words of any kind. 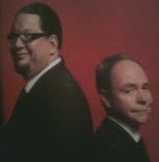 His name is Teller and he’s one half of the internationally acclaimed magic act of Penn & Teller. When NumberOneSon bought tickets for Mrs. LanceAround, myself and NumberOneEmber to see them at the Hard Rock Cafe in the Universal Orlando Resort, we knew they would put on a fabulous magic show. What we might not have know, at least until we saw the show, is how funny they were. Yet, it was more than just that; they told stories, wonderful stories, sometimes with words (Teller may stay silent but Penn has no such inclinations) and sometimes just within their act. It was amazing how much Teller could communicate without saying a word. One time, he gave the appearance that he was swallowing needles and you could “see” them sliding down his throat. Another time he was slicing rose pedals off a flower and the pain of the dying rose was visible in his very demeanor. 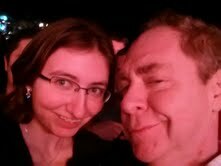 At the end of the show, NumberOneEmber ran into Teller outside the theatre. He spoke with her as well. I couldn’t hear what he said as I did not press into the crowd with NumberOneEmber. But I could see he was speaking to all the eager theatre goers who surrounded him. I only hope he shared with NumberOneEmber some wisdom that he has acquired in his almost 40 year partnership with Penn Jillette. I hope he helped her to understand that a story can be told just as powerfully without words and without voice; that it’s the essence of the story that will draw the audience in, even if they don’t hear a thing. I hope she understands that any words she writes are meaningless unless they further the story. Of course, if they want to hear something, Penn is nearby and he’s capable of talking a lot. Yet his stories are also worth listening to. The real trick is to have just the right amount of words for the story; no more, no less. This entry was posted on February 2, 2013 at 9:56 am and is filed under Live Theatre. You can follow any responses to this entry through the RSS 2.0 feed. You can leave a response, or trackback from your own site.